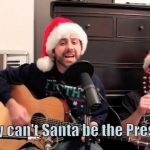 Act Out Theatre Group is celebrating the holidays with three festive events in Dunmore this December: “Elf Jr.,” the theatre’s annual Holiday Revue, and a free family fun night. Running Friday, Dec. 7 through Sunday, Dec. 9, “Elf Jr.” is a condensed version of the full-length musical based off New Line Cinema’s 2003 Christmas movie “Elf” starring Will Ferrell. Buddy, Santa’s clumsiest and largest elf, is portrayed by Max Snyder of Moscow in this production. When Buddy finds out that he is human, he makes the trek to New York to find his human father, Walter Hobbs, played by Caelan Baden of Taylor. Through his journey, Buddy meets the jaded Jovie (Sarah Pugliese of Wilkes-Barre Township) and learns he has a brother, Michael, played by Mason Matthews of Wilkes-Barre. Matthews also plays Charlie, the head elf. 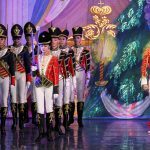 High-energy musical numbers and comical misunderstandings make this a show that no one will want to miss. The cast, which includes two sets of siblings, also features Santa Claus (Will Block of Bear Creek), Emily Hobbs (Emily Carey, Dunmore), Deb (Samantha Greenfield, Old Forge), Charlotte Denon (Ava Kulenich, Clarks Summit), Ms. Greenway (Allie Katz, Clarks Summit), Sam (Dylan Ofner, Scranton), Matthews (Milana Snyder, Moscow), Chadwick (Lorcan Baden, Taylor), Darlene (Ava Wheeler, Taylor), and Emma (Julia Cirba, Scranton). Pugliese is having fun playing Jovie. 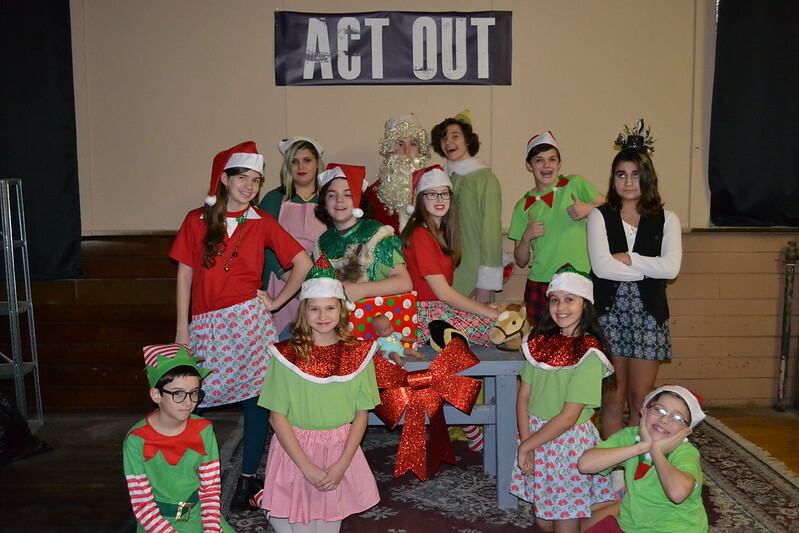 Along with “Elf Jr.,” Act Out is also presenting its annual Holiday Revue on Thursday, Dec. 20 and Friday, Dec. 21. Act Out Theatre Group recently relocated to Dunmore from Taylor. Act Out has become a second home for Baden. “I get to act alongside some great performers who I’m happy to call friends,” Baden said. The theatre group is also hosting a free family fun night on Friday, Dec. 14 from 6 p.m.-9 p.m. The event will have music, karaoke, and contests, as well as games and snacks for purchase. Children can be dropped off or attend with an adult. 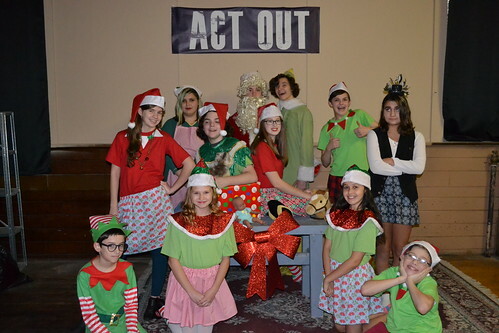 “Elf Jr.” runs on the Act Out stage (150 E. Grove St., Dunmore) from Dec. 7 through Dec. 9, with performances Friday and Saturday at 7:30 p.m. and Saturday and Sunday at 2 p.m.
Tickets, which are $20 for adults and $15 for students/seniors, can be purchased by e-mailing actouttheatre1@gmail.com. Tickets can also be purchased at the door. Pre-payment is not required. Reservations are recommended but also not required. 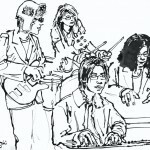 Act Out’s annual Holiday Revue takes place on Dec. 20 and Dec. 21, with both performances starting at 7:30 p.m. All tickets for the holiday cabaret are $10. 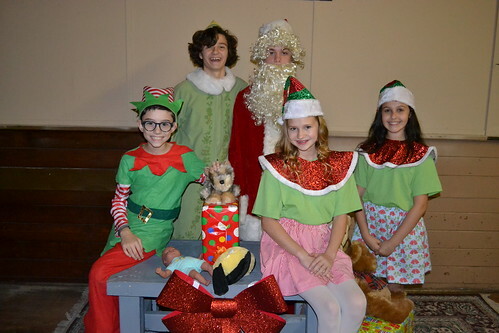 ​The cast of ‘Elf Jr.’ includes, from left, first row: Mason Matthews, Samantha Greenfield, Sarah Pugliese, and Dylan Ofner. Second row: Ava Wheeler, Allie Katz, Caelan Howe-Baden, Will Block, Emily Carey, Max Snyder, Lorcan Baden, and Milana Snyder.